The numbers are mind-boggling: Since 1968, more Americans have died from guns in the United States than on battlefields of all the wars in American history. And if we do nothing about it, one million Americans will be shot in the next decade. Thus according to the June 5 speaker at the library's South End Writes series, David Hemenway, Professor of Health Policy at Harvard University, and Director of its Injury Control and Research Center. He presented a picture of a gun culture in the United States that he, and many of his public-health colleagues, believe is unnecessarily violent and destructive. He proposes a multi-faceted public-health approach of changing laws and norms that would reduce the lethal consequence of Americans' affinity for gun ownership to more acceptable levels. Hemenway's public-health mantra is: Make it easy for people to stay healthy and difficult too become sick or injured. In other words, focus on prevention to benefit the entire population and switch the focus on gun-violence reduction from the curative (actions to heal individuals after gun violence has occurred) to the preventive (forming a broad and inclusive coalition with shared responsibilities to eliminate harm to the population at large). 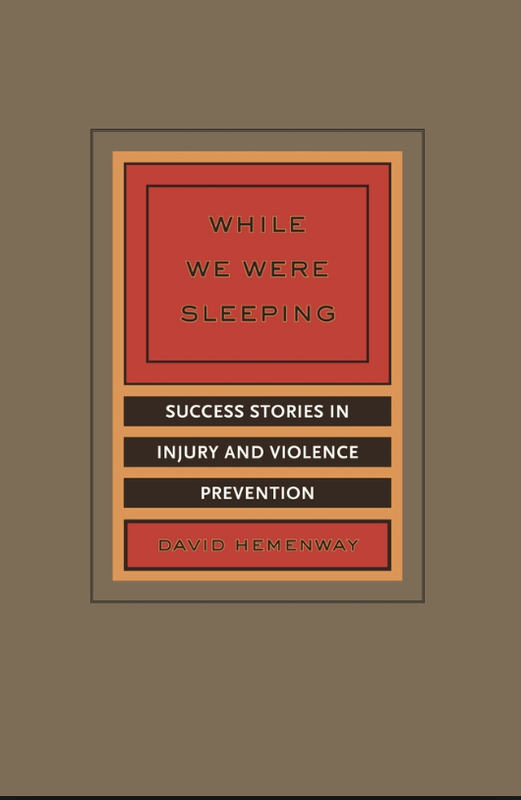 The author of Private Guns/Public Health and While We Were Sleeping: Success Stories in Injury and Violence Prevention, Hemenway has solid reasons to believe he is right. He cites the powerful example of the US Center for Disease Control (CDC)'s great public-health accomplishment of the 20th century, namely the 85-percent reduction in deaths resulting from motor vehicle accidents. In the 1950s and 60s, public-health physicians changed the question from "who caused the fatal car crash?" to "what caused the injury?" Instead of blaming the driver every time for drinking while driving or running a red light, just as today 'irresponsible'gun owners are blamed for gun violence, researchers in the 1950s looked at what caused the injuries. They found that the quality of the vehicles and the prevailing condition of the roads and highways were sub-par, and often major factors in the fatalities. Resulting safety mandates for automobiles (seatbelts, car seats, head rests, safety glass) and highways (removal of telephone and light poles, trees and better signage) eventually cut the death rate of car fatalities by four-fifth. "Just as banning cars was not an option then, neither is banning guns now," Hemenway points out: More than a third of American households own guns. But the unrestricted use of guns and weak gun-control laws that prevail today come with a high cost, financially and emotionally. In the 1990s, the medical cost of gun shot injuries and death was estimated at $6 million a day. Gun injuries are the leading cause of uninsured hospital stays. The best estimate of the price tag of gun violence is about $100 billion a year. The consequences of the emotional trauma of participating in or witnessing gun violence can last a lifetime, he says, and the routine injuries to brain and spinal cord are devastating. Hemenway, who won the Excellence in Science Award from the American Public Health Association and has been recognized by the CDC as one of the twenty most influential injury and violence prevention professional, proposes a multifaceted approach of harm reduction in which no one is blamed but everyone involved in the gun debate participates to find a broad-based solution. The goal is to reduce fatalities by, among other things, lifting the ban on research into gun usage, now mandated by the Dickey Amendment, in place since the mid-1990s. This would produce solid statistics as to why in the US the suicide rate is 12 higher than in similar developed countries, or why homicides here are 18 times higher. "Outside the US, countries have similar rates for violence, crime, bullying and aggression/depression rates among children," Hemenway says. "The only difference seems to be that Americans own an enormous number of fire arms." However, the CDC's so-called Behavioral Risk Factor Surveillance System (BRFSS) which collects state data about U.S. residents regarding their health-related risk behaviors, can't include questions about gun ownership or gun violence in their interviews, or risk losing CDC funding. Hemenway's response to 'what we need to know about fire arms research' can be answered in one word: Everything. Specifically, the subjects to be researched include gun theft, gun training, open gun carrying, gun storage, gun suicide, gun accidents, gun threats, gun use in self-defense, gun use to intimidate, guns in intimate partner violence, straw purchasers, smart guns, effect of gun laws, gun law enforcement, gun transfers, gun shop practices, concealed gun carrying, guns on college campuses, guns at work, guns and alcohol, police and guns, assault weapons, Saturday night specials, penalties for illegal gun use, gun trafficking, liability laws and guns, insurance for gun owners, women and guns, children and guns, minorities and guns, Second Amendment, gun ranges, guns and hearing loss, guns and lead poisoning, gangs and guns, background checks, police discretion, machine guns, burglary, home protection alternatives, and so on. 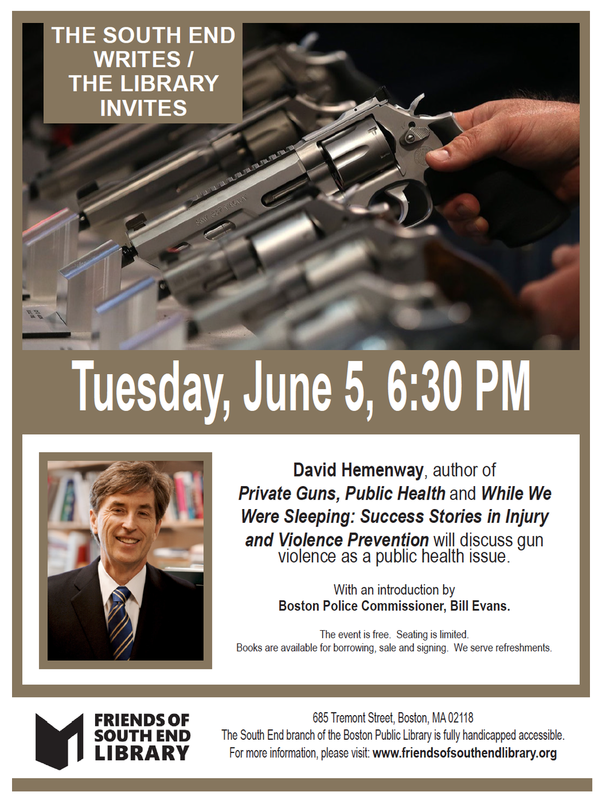 Boston's Police Commissioner, Bill Evans, a strong proponent of strict gun laws, who joined the Boston Police Department as a rookie in 1980, introduced Hemenway for his talk at the South End library. Regrettably, the Commissioner could not stay long after his introduction. He was called away to a public-safety emergency..someone had been shot. Older PostAcclaimed Novelist and Short-story Writer, Allegra Goodman, Delves into the World of Teachers and Gamers, the Focus of her Latest Book, "The Chalk Artist"